Bluehost includes an automated WordPress installer, which makes the process very easy to get WordPress installed and set up on your domain. 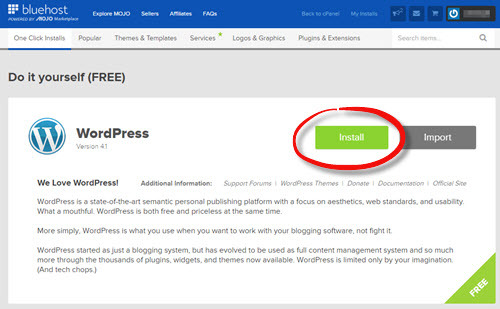 When you log in to Bluehost, look for an icon “Install WordPress“. Select the domain you want to install WordPress on (for new hosting accounts there should be only one domain), and leave the directory blank. You want WordPress to install on the root directory so that when people go to Yourdomain.com, they see your website. Click Check Domain. Congrats! You now have a website! Yes, it’s a very basic, default website, but it’s live. You should be able to go to Yourdomain.com and see what it looks like. You’ll probably see a “coming soon” page, which we’ll be getting rid of very soon. I always get excited whenever I launch a new site. Even after just installing a bare WordPress site, there’s something magical about.